Alerts are a powerful feature when combined with Spectro. The reason is pretty simple, let’s face it, most of us we can’t sit in front of the charts all day long – unless you are already a fulltime trader, even if you are one alert help you find faster what is approaching the condition you use to start your trades. Using alerts correctly allows us to focus on other things, while we keep watching important signals in the background. Reading their official guide is worth your while, click here to improve your triggering options further. Most of the alerts can be created by checking if a feature returns true. In the following alert, the RSI Method Bull Divergence’s alert is set by checking if its condition is true. This is done by setting the alert so that it detects if the value for the RSI Method is greater than 0.9. If the RSI Bullish Reversal Method condition yields a 1, it means that this condition is true. Because when something is true it’s equivalent to 1, and if it’s false it will be 0. If it’s greater than 0.9, it means the true condition was just triggered. Once Per Bar gives you a faster reaction, but it will trigger even for weaker signals that might fade away. Remember, the market is a living thing so that the condition might be true now, but if someone dumps or something like that happens it might as well reverse, that’s why some signals disappear since the indicator works on real-time data. 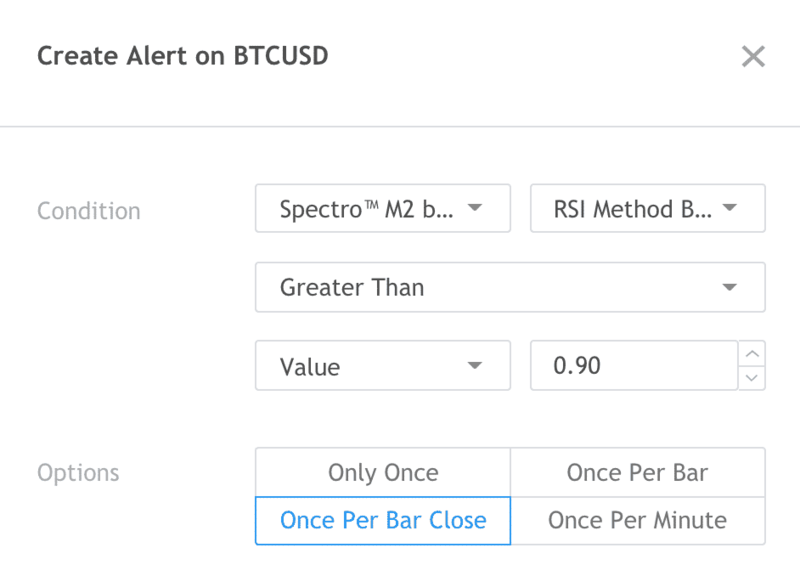 Once Per Bar Close gives you a safer, stronger and confirmed signal as it waits for the close for confirmation, this will sacrifice speed, but it will only show you signals that the conditions are stable and won’t reverse. Only Once will pause once it triggers and will require you to manually start it again. Once Per Minute is a brand new feature that is awesome if you need a fast signal and yet test its strength. If it keeps triggering, the stronger the signal is. The conditions for the following alerts are set differently to get them working properly. Bullish clouds happen when the SCloud Algo is greater than the Price. Bearish clouds appear when SCloud Algo is less than the Price. It’s as simple as that; it’s just like the visual logic you observe on your chart. When a bullish clouds forms, its ceil is above the price action. The bearish cloud follows the same logic but inverted. Ehler’s Trend Analyzer turns green when the Ehler/Smart Trend is crossing up over the Ehler’s Base. The reverse is when the Ehler/Smart Trend is crossing down over the Ehler’s Base, which happens when the Ehler’s Trend Analyzer turns red. 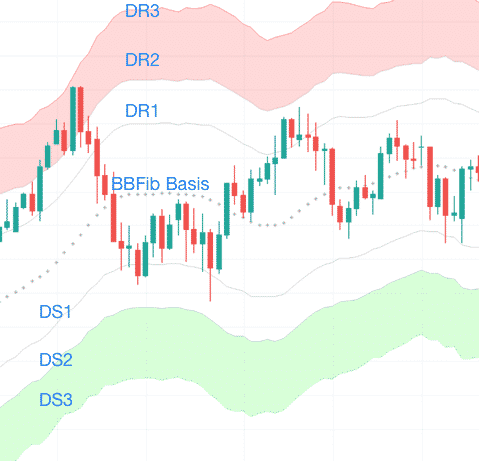 To set up alerts for when the price is in a specific channel, you have to set it up so that Upper Bound is the top of the channel and Lower Bound is the bottom of the channel. In the following example, the alert is set up to detect when the price is oversold, so the top is dS3 and bottom is dS4. Entering Channel option will set it so that it only triggers upon entrance. This option will make less unnecessary alerts as Inside Channel option will trigger. These channels work the same way as the Murrey Channels above. The following example is an alert for when the price enters the oversold channel. You might be wondering what DS, DR, and sR, sS are, those come from Dynamic Supports and Resistances and Static Supports and Resistances. 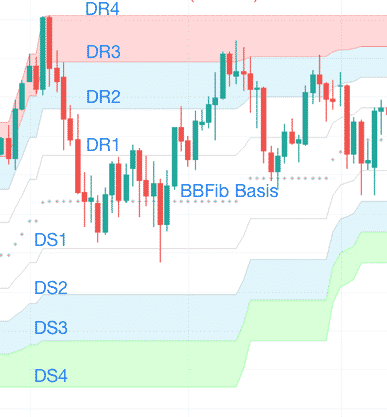 For instance, the dynamic levels are the most reactive one, such as Murrey’s Channels and BB Fibo. The Static ones come from the adaptative Fibonacci and the full Fibonacci. This handy reversal zone indicator tells you when the current move is about to lose its strength and reverse. The way it works is by changing the background color to an aqua color(by default). Setting the alert for this condition is pretty simple.